Linlithgow grabbed their only try just before half time but Duns cruised the second period. Duns entertained old friends Linlithgow at Castle Park on a warm, sunny autumn afternoon and scored eight tries to win 48-10 in a match which was nowhere near as one-sided as the scoreline might suggest. Duns opened the scoring with less than 10 minutes played. Picking the ball up on the 10 metre line, Dale Robertson still had a lot to do but shrugged off tackle after tackle to reach the line eventually – too far out for his own conversion attempt. Linlithgow grabbed their only try just before half-time, but Duns cruised the second period. Only a couple of minutes later, great interplay between backs and forwards saw Ryan Burns come into the line from full back and he crossed the tryline wide on the left and then ran round behind the posts, before touching down to make Dale Robertson’s conversion a formality. Linlithgow kicked a penalty midway through the half to narrow the gap to 12-3. Michael Thomson went over again shortly after for another unconverted try. Linlithgow weren’t there just to make up the numbers, and, for the closing period of the first half, they were the better side. They scored their only try of the game with a break up the middle of the park, and only very resolute defence kept them out before half time. Had they scored at that stage, the scores would have been tied at the interval but, crucially, Duns had their noses in front at 17-10. The home side started the second half with much more determination and Josh Herbert ploughed over from close range. The re-start kick was caught by Michael Thomson and he beat the first man, then sprinted clear from inside his own half, showed a clean pair of heels to the covering full back and touched down for a fantastic individual try – his sixth in only five matches this season. Both conversions were missed but, suddenly, Duns had extended their advantage to 27-10. The next try came from Josh Herbert, who took a quick tap penalty deep inside the visitors’ 22 and crashed over the line. Dale Robertson kicked the conversion, to ironic cheers from spectators and team-mates alike. 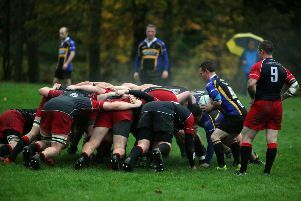 As the match entered the closing 10 minutes, Duns scored try number seven. David Hutchison made a break up the right wing and, when his progress was halted, he had Ryan Mania on his inside to take the scoring pass. He just managed to squeeze over in the corner and Keiran Wilkinson kicked a real beauty of a conversion from the touchline, on the wrong side of the park for a right-footed kicker. On the stroke of full time, David Hutchison scored the final Duns try, again up the right wing. He had the opportunity to get closer to the posts to narrow the angle for the conversion but chose instead to touch down as close to the corner as he could. Keiran Wilkinson picked up the gauntlet and calmly slotted another terrific kick to take the winning score to 48-10. 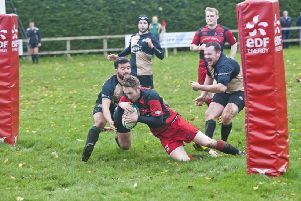 The five league points won by Duns, combined with North Berwick calling off their fixture at home to Hawick Harlequins, when they couldn’t raise a full side, meant Duns leapfrogged Hawick into third place in the league table. Linlithgow, meanwhile, remain rooted to the bottom.